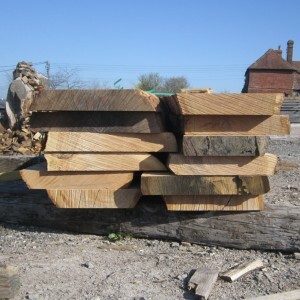 In heavy structural timber framing the bracing is often done with what we call ‘grown’ curves. These are usually limbs of a tree that have grown with a natural curve and therefore incorporate a natural tension/compression within them (nature’s version of a pre-loaded concrete beam!) so are ideal for bracing. Where a traditional frame is being restored, or built as a residence, or a barn structure requires authentic timber replication then these fit the bill. An alternative to a ‘grown’ curves is a cut curve, a curved brace that has been cut and shaped from a blank section of straight grown regular structural timber. These may be more suitable for use on single storey buildings where bracing has less loading or on new builds which don’t require such authentic attention to detail. 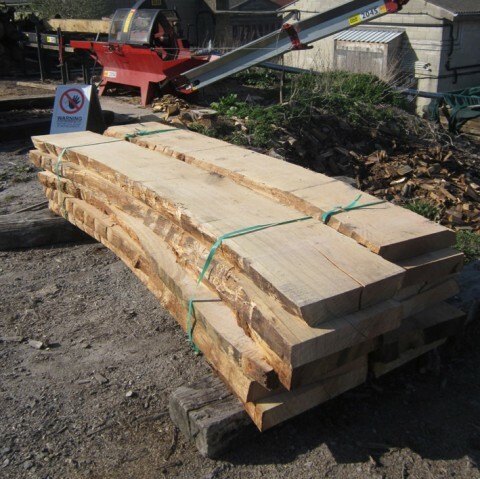 As curves don’t exactly grow to order we supply a complete fresh sawn through & through board that has been cut to achieve the requirements and then the actual shaping is done by the framer. We also keep air dried curves in through & through stock in the yard which may be more suitable than fresh sawn curves for renovation and restoration work. In our experience the timber framers specifying curved braces are skilled craftsmen and know how to work the timber to get the best results. At this time we don’t have any in house curves shaping facilities but we’d be glad to put you in touch with skilled framers who can help. Alternatively, have a look at our customer page to find a framer you like the look of! We can provide chain of custody certification for Grown in Britain, FSC & PEFC . Read more about certification. 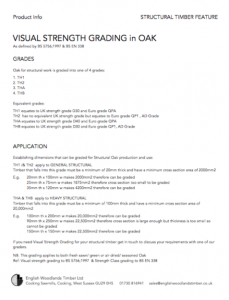 We offer a TRADA certified Visual Strength Grading BS 5756 for Oak as an additional service. See the pdf below for more information. Need some advice? 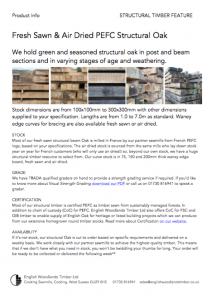 Got a structural timber your cutting list? Use the form below to upload your documents for Chris, Grant & Nick to fettle with. Accepted file types: jpg, pdf, docx, xlsx, . 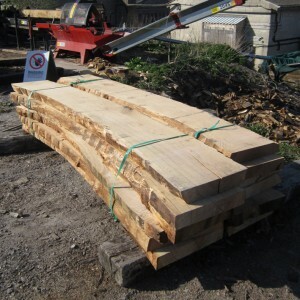 Stay in touch with what's going on at English Woodlands Timber. Receive blog posts, news, special offers and invites to tea! P.S. We promise will never share your email address with anyone else.